This review has been updated for itSeez3D 4.1. This update adds a new subscription-based business model, improved object scanning and a new environment scanning feature. I also made some small edits for version 4.3 that includes a face-detection bypass for scanning people with helmets (and VR headsets). In Part 1 of this Review I tested the Structure Sensor—or iSense—hardware and the apps build by the manufacturer. In this second part, I’m focussing on a third party app. 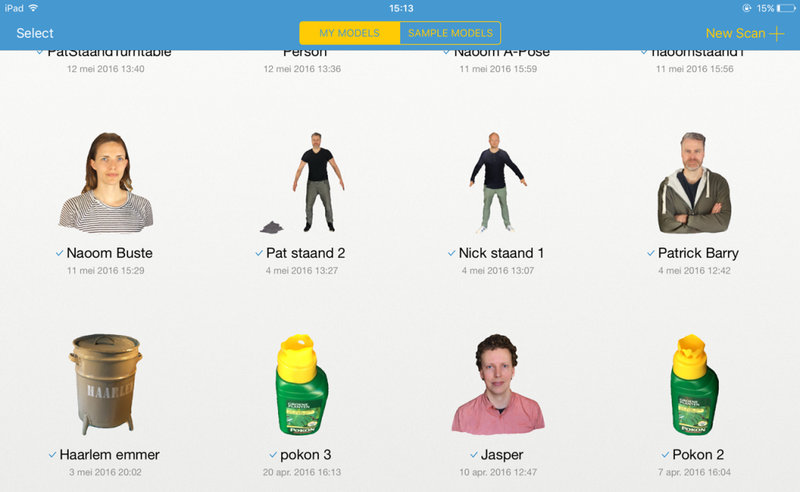 While the name might sound a bit funny, itSeez3D is very powerful and polished 3D Scanning app. The iPad version is specifically designed to be used with the Structure Sensor. There’s also a Windows version designed to be used with tablets that have an Intel RealSense R200 sensor. I Reviewed that version in combination with the Wacom MobileStudio Pro. In earlier versions, itSeez3D was completely free without limitations for non-commercial use and offered a commercial version for a one-time fee €1000. With version 4.1 this is no longer the case. Instead you can choose between a free Individual version and a payed Pro and Business version. It’s good to realize that while the free version offers unlimited scanning, you’d have to pay $7 to export a scan. This is true for exporting the 3D model file through e-mail or uploading it to Sketchfab. You can now export your 3D scan to Sketchfab from the Individual version (or any other version) free of charge! The only limit is that doing this won’t allow you to make your Sketchfab model downloadable. If you want to enable downloading, you have the option of paying the export price for this. 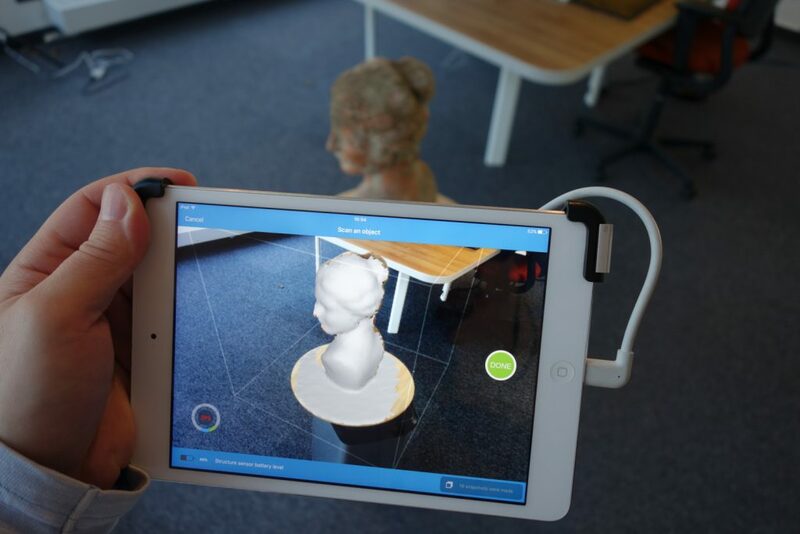 The first nice thing I noticed about itSeez3D is that it saves your 3D scans—both locally on the iPad and in the Cloud (more about the latter later)—which is a great way to build a library and give quick interactive 3D previews to other people. The library is searchable so it’s easy to find scans if you have many. Before making your first scan, it’s good to know that there’s a settings panel with only one option: enabling high resolution textures. This prevents downsampling of the photos taken during the process to 3 megapixels. It’s off by default to make uploading faster, so leave it off when you’re on a slow internet connection. Turning on High Resolution mode made no visual difference with my 5 megapixel iPad mini 2 camera and I got a 4K texture map for a bust scan with both settings, but I can imagine the difference with a 12 megapixel iPad Pro camera could be significant—at least visually. I’ll go into them one by one. In this mode the iPad is held in landscape mode and the object you want to scan must be placed on a flat surface, like a table or a floor. Since it uses both shape and color information for tracking during the scanning process, I discovered it’s good practice to put your object on a surface with many color or contrast details. The flat surface is automatically detected when making a scan and won’t appear in the preview. This makes it easy to see which parts of the object have been scanned, because they will appear in white. An 360-degrees indicator also guides the scanning process by showing your progress in 10 steps, similar to the Autodesk 122D Catch photogrammetry app that I reviewed recently. Scanned objects are automatically cropped at ground level, which is a nice time-saving feature. The bottom surface is textured automatically by blending surrounding colors and looks good in most cases. In the new version, the object scanning preview shows a less-detailed preview of the mesh. All details are still captured, but this preview mode is a lot smoother—especially on older hardware like my iPad mini 2. As you can see above, the software detected my IKEA Snudda turntable (read more about this and other 3D scanning must-haves in this post) as the floor surface. And while earlier versions could lose tracking when the floor surface was out of view I could now also scan the subject from a bottom-facing angle without problems. 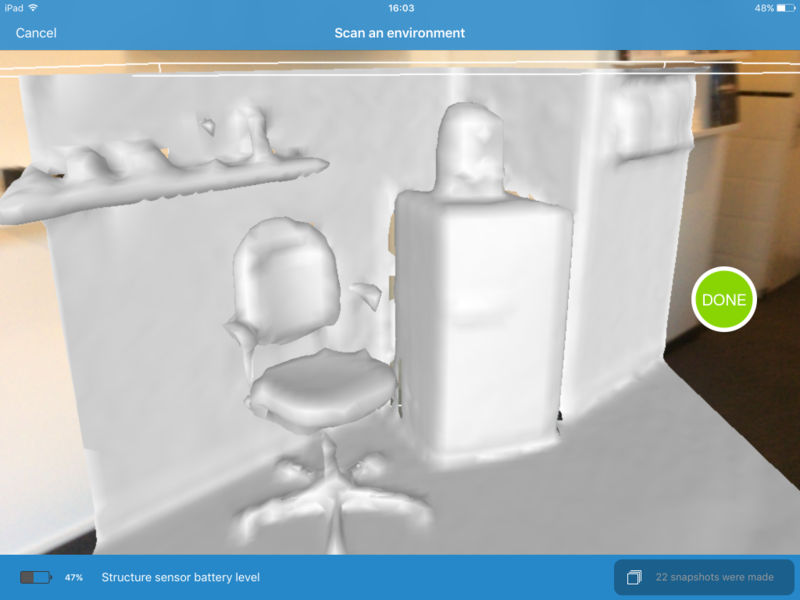 With the newly updated object scanning mode, itSeez3D is on par with the Occipital Scanner app when it comes to usability. However, the quality of itSeez3D is a lot better due to the cloud processing. To quantify this, I’ve put a 3D scan of Teddy from both apps below that were captured with the same light setup. The Scanner App version (top) has 16K polygons (including the book and turntable) while the itSeez3D version has a polycount of 50K for the bear alone. Below is another scan of the trike of my toddler daughter, made on the living room floor on a placemat with regular indoor lighting. I’m impressed with how itSeez3D handled the holes in the glossy black wheels. The scan above was made by freely walking around the bust and took about 2 minutes. It has a polycount of 48.5K. You can switch the Rendering mode in the Sketchfab embed above to MatCap to see the geometry without the textures. If you zoom in on the textures, you can see it’s sharper in some areas than on others. This is probably due to motion blur from the iPad’s RGB camera. Since version 4.0, itSeez3D no longer asks you to stop once in a while so it can take a texture snapshot. This does make the experience a lot smoother, but the downside is that it can introduce motion blur to the snapshots. Personally, I would like to be able to have this as a setting which can be switched of if necessary. I don’t mind standing still to get better textures. What’s the difference with a Professional 3D scanner? I get a lot of questions about how 3D scanning with a depth sensor compares to a more expensive, stand-alone 3D scanner. 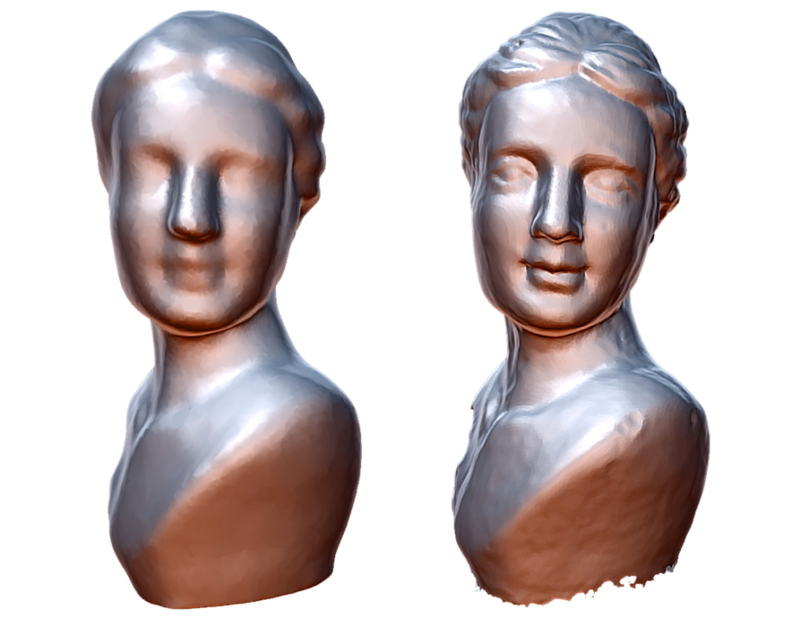 Here’s the geometry of same Bust scanned with the Structure Sensor & itSeez3D followed by the (±€4500) EinScan-Pro I reviewed recently. Both are scanned by freely walking around the bust. People scanning mode requires your subject to have a face. That sounds obvious and the face-detection is excellent, but it prevents scanning people with helmets—or shiny new VR headsets. The upside is that the algorithm knows where the face is and makes sure that part is covered by a single photo. This ensures that the face is textured correctly. Update: version 4.3 of itSeez3D adds a feature that let you bypass face recognition to scan people with helmets. Great for cosplay or a 3D selfie with your brand new VR headset! While texture of the 3D scan of my business partner Patrick I made with the Occipital Scanner app looks okay on the 3D model, the texture map is quite messy and 2K resolution (first image below). The texture map of itSeez3D is still very Picasso, but as you can see it has a lot less segments and Patrick’s face is in one single part—and from a straight angle—which makes 2D retouching in Photoshop easier. It’s also 4K which results in more detailed textures. 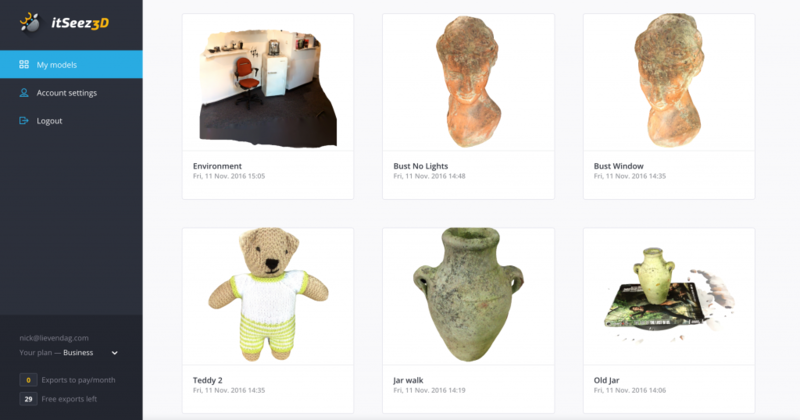 Want to make the texture maps of your 3D scans even better? Check out my UV Texture Remapping Tutorial. Scanning humans gives you two options: holding the iPad in landscape mode activates bust-scanning mode and holding it in portrait mode allows full body scanning. You can do this by walking around a person, or by using a turntable. In case you’re wondering: I mirrored the iPad’s display on the flat screen on the wall using an Apple TV. I tested electric turntables kindly made available by Dutch manufacturer Pre-Motion. I discovered that their slowest version with a rotation speed of 0.8 RPM worked perfectly in combination with the Structure Sensor and itSeez3D. I put a foot switch in the power cable so I could scan the front and face first and then start the rotation hands-free. The benefit of using a turntable is that you can perform a scan on a smaller surface area. I used 2 softboxes instead of the 3 I use when free-scanning. Altogether this saves more than half the floor space so it’s ideal for scanning people at events like trade shows. Below are the bust scans I made of Patrick with both the Occipital Scanner app and itSeez3D right after each other. As you can see, the amount of detail in the latter is much higher—both in therms of texture quality and geometric detail (tip: hit the fullscreen button on these Sketchfab embeds). Holding the iPad in portrait orientation switches the itSeez3D app to Full Body mode. While it works the same as bust scanning, it’s a little harder to do. You can’t simply move further and capture a whole person at once, because that will result in a lower quality scan. So you have to move and tilt the iPad around the person from a close distance to get all the parts. I discovered that this can also be done on a turntable, but is much easier to do while just walking around a person, because you can take your time to point the scanner at difficult-to-reach areas like the inside or arms. That way it’s also easier for the tracker to keep its bearings. One downside of the Full Body mode is that the preview accuracy is quite low. 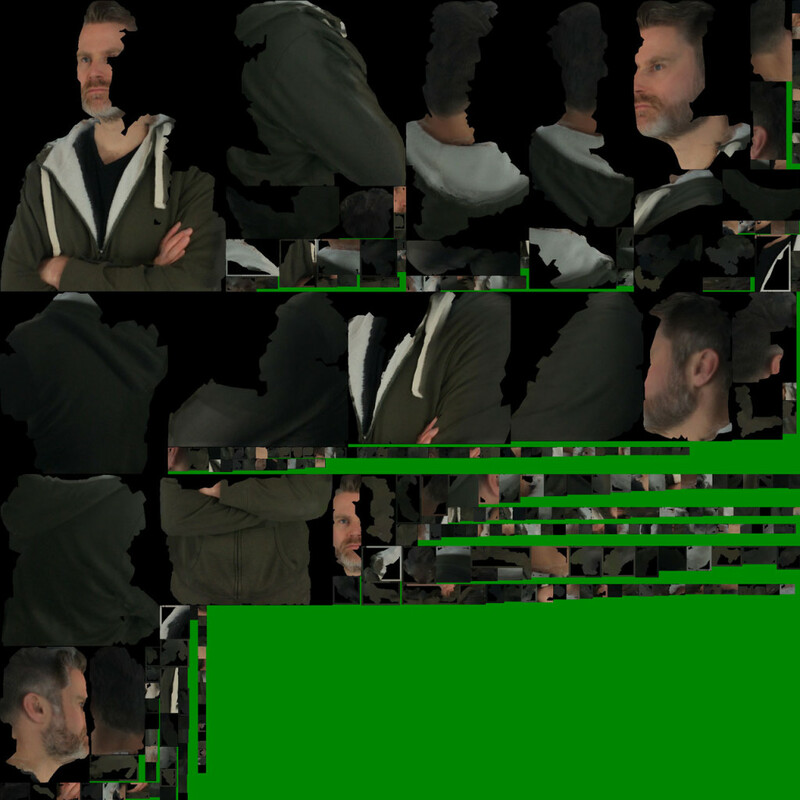 As you can see in the screenshot the preview is made out of rather large white polygons making it hard to see if you have captured all (facial) details. While the floor is also covered by the preview, it’s removed during processing. That’s me on the turntable. We put some painter’s tape on my shirt to help the tracker with the back of my definition-less t-shirt. Some small pieces also work fine. As you can see itSeez3D is smart enough to remove the floor, but you naturally have to remove the turntable manually, or just enable the turntable animation in Sketchfab like I did for the embed above. While the box that you use to pre-determine the scanning area can be scaled, it unfortunately does so with a fixed ratio which has a rather large floor surface. This makes using a turntable less convenient, because you have to place that relatively far away from walls or objects in the background. It would be great if the box can be scaled separately in all dimensions. The results of a Full Body scan are lower in quality than bust scans. If you want best-of-both-worlds, then you can just do both and creatively fuse the higher quality head onto the body. Oh, and here is quick scan (near a window, no light setup) of me with my Oculus Rift on. With version 4.3 of itSeez3D, I could finally make that scan. 3D Scanning is very memory intensive and I experienced quite a few occasions where itSeez3D stopped because the RAM memory was full. Of course my iPad mini 2 has just 1 gigabyte of RAM, while an iPad Air 2 has 2 gigs. The iPad Pro 12.9″ even has 4 gigabytes. That’s a lot faster than completely restarting the iPad, which is advised in the itSeez3D FAQ. 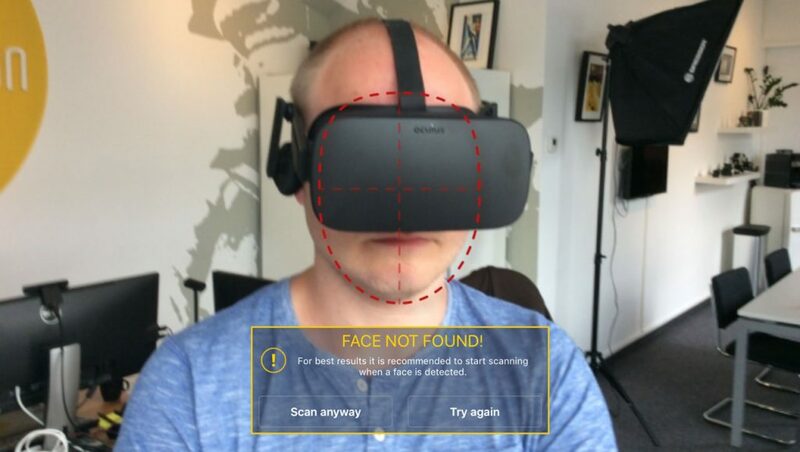 If you read part one of my Structure Sensor Review you know that I also tested Occipital’s Room Scanning app. While it works nice and is great for measurements (Occipital just released a new app for room measuring, called Canvas), the visual quality of the texture mapping wasn’t good enough for the scans to be used for aesthetic purposes. The experience is similar to object and person scanning and works very well. Before scanning, you can select the desired area by scaling the cube-shaped bounding box with pinch gesture. After that, you can start scanning and walk around freely to cover all sides. The result is better than I expected. It didn’t get the small cameras on the shelf, but the other objects are recognizable and the texture mapping in actually pretty impressive. I’ve optimized the Sketchfab embed above for viewing in Virtual Reality, so if you have a VR headset, you can take a look at this environment as if you’re actually there. I’ve tested it on an HTC Vive and Google Cardboard and it works surprisingly well. I’m surely going to experiment with capturing larger rooms, or maybe capturing small parts and put them together in a 3D software package. After a scan is complete it will be added to the library. You can also give it a name and description. The great thing is that the unprocessed scanning information is now stored on the iPad, allowing you to make another scan right away! This is done locally on the iPad, just like the Occipital Scanner app. The quality of a bust scan in this mode is a bit like you’re a character in a first generation 3D video game, but it only takes a few minutes and is a great way to check if the color information is evenly lit and in focus on all sides. And if you missed an important part of the geometry, it will also be noticeable in the preview. Transforming the raw 3D data—also called a Point Cloud—from a “structured light” 3D Scanner like the Structure Sensor into a high quality 3D Mesh is a very computer-intensive task. Certainly not a task for a tablet computer, because it will will probably drain the battery before it’s finished. That’s why itSeez3D uploads the 3D data—and the photos for the color information—to the cloud for processing. It has clear progress indicators for both the upload and rendering process. It’s possible to start a new 3D scan while uploading, but I won’t recommend it—at least not on a low-end iPad mini 2. When the rendering is done and final model is downloaded back to the iPad, you can view the high quality object from the library at any time you want. You can export the model by emailing it as a .PLY, .OBJ or .WML model for editing in your favorite 3D Modeling or Sculpting application. Another nice feature is that you can share your scan directly on the popular 3D showcasing website Sketchfab. In version 4.0 and higher, you can go straight to the web interface of itSeez3D from the app by tapping the cloud icon in the toolbar. Here you can manage your subscription and models. You can view every model here through an interactive 3D viewer. From here, you can also download your models and share them through e-mail or social networks. The landing page and viewer aren’t as comprehensive as that of Sketchfab, but they’re designed nicely and work well on both desktop and mobile. 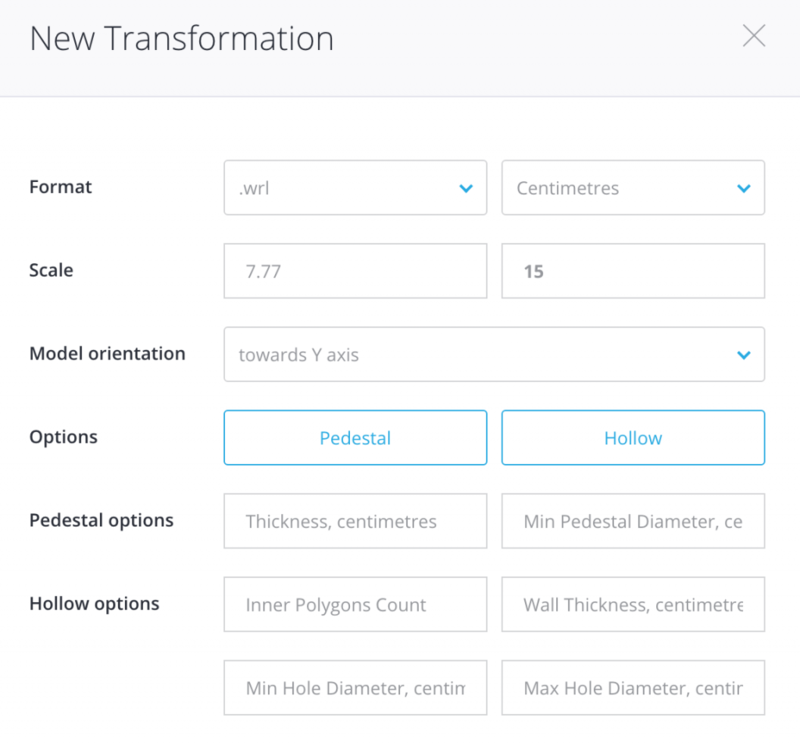 You can also transform the model to set the scale and perform automatic actions that are required for 3D printing like making the model hollow or adding a pedestal for stable placement. The new version adds more control over these, like the thickness of the walls and the diameter and thickness of the pedestal. This Transformation feature is very convenient if you want to print many mini figurines and don’t have the knowledge or time to dive into 3D editing software every time. It works as expected. I got the processed model in my inbox within a minute. I decided to try out Shapeways and discovered that the .WRL format and a wall thickness of 0.3 cm works best for this 3D Printing Service. As you can see below, making a model hollow is a quick way to save on printing costs—less than half the price (prices are for a 15 cm tall figurine). I think the combination of saving both time and printing material will make up for itSeez3D’s subscription price and export fees for most professionals that are using the app for 3D printing figurines. The new version adds great improvements for object scanning and also a peek into the future with the experimental environment scanning feature. The updated app also runs a bit smoother on my old iPad mini 2. The new subscription-based business model that came with version 4.1 will surely be received with mixed feelings. 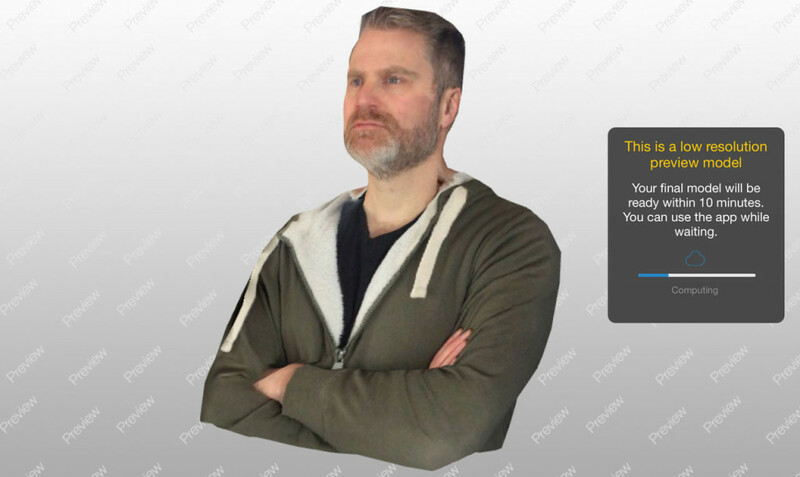 If you’re planning to use the app to create and sell 3D-printed figurines—which clearly is the target audience—you’re getting a nearly automatic workflow that requires little-to-no manual post-processing. These features will pay for themselves and are within the margins that most scan-to-print services charge for figurines. However, if you want to use itSeez3D to scan objects, people or environments for purposes that don’t directly generate income, you will probably have to do some calculations before getting a Structure Scanner and an itSeez3D subscription. It’s good to stress that while exporting scans with free Individual subscription will cost $7 per model, you can share them for free through the itSeez3D web interface. That said, I do understand that the developers behind itSeez3D have to make money to keep updating the app and keep their cloud service running. Keep in mind that they just make the app and get no share of the hardware you buy. That’s both a pro and a con of open hardware like the Structure Sensor—good third-party software will cost you. And for scanning directly on the iPad, itSeez3D currently has no competition. 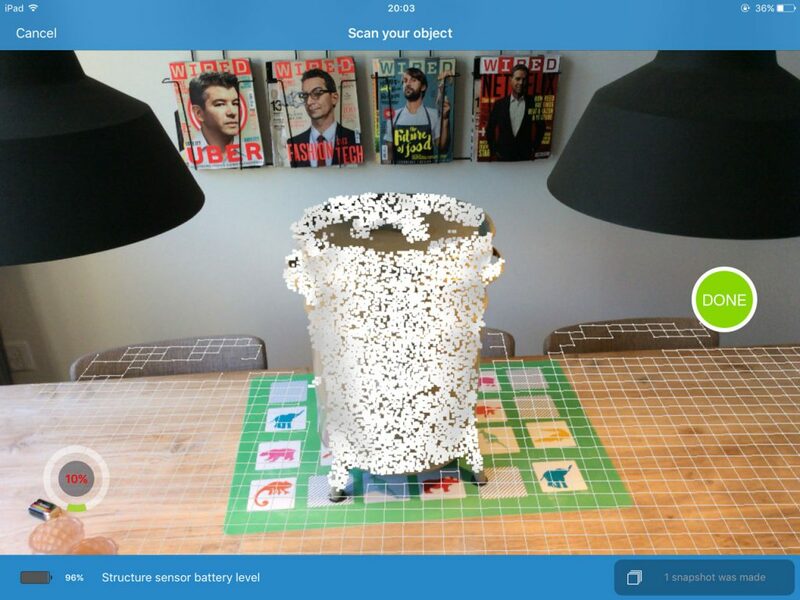 If you want to scan for free, you can still use Occipital’s Scanner App, albeit with less exciting results. Or you can read my Review of Skanect — a $129 (for the Pro version with unlimited scans) application that runs on a PC or Mac. 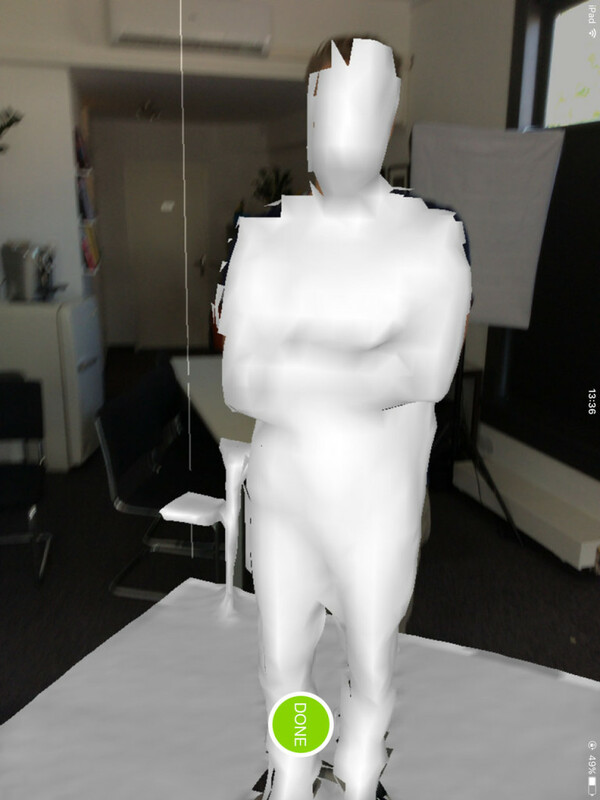 You can use the Structure Sensor and iPad stream 3D scan data to it over WiFi. This requires a more comprehensive hardware setup but it allows a greater diversity in scanning projects and features a complete suite of mesh editing tools. The new version of Skanect (1.9) has improved texture quality that gets closer to that of itSeez3D than earlier versions. Loved the article, I have a background in fashion and wondered are there any 3D scanners that can take measurements?? 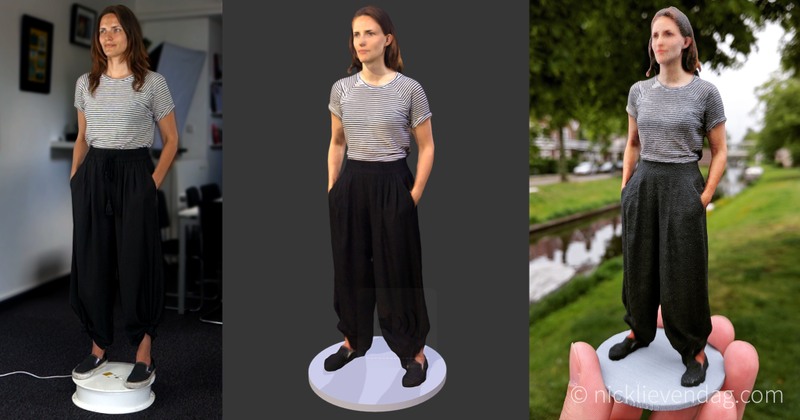 Yes, almost any 3D scanner, including the Structure Sensor, produces size-accurate 3D models for measurements and can be great for fashion. Great review. I was wondering if Itseez3d was worth buying an ipad, and is sounds like it is. I am using the structure sensor on my iphone 6s, and want higher quality scans. I use them as reference material, as I am a figurative sculptor. Are you going to get to the 3rd part, and review the uplink mode for the structure sensor? I would love to know how the quality compares. As far as I know itSeez3D only works on an iPad, not on iPhones. There will indeed be a third part of this Review Trilogy, about Skanect. Actually, I started testing a new Beta version of Skanect as of today. This new version has such promising new features that I chose to wait with my Skanect Review before it’s out. Hey Nick, Very well written article that offers so much info. I am not tech savvy and all of this looks possibly plausible for architectural scanning of existing buildings to obtain “as built” information. Is this capable of accurately defining interior and exterior dimensions of a building or is it a bit more of a general measuring tool but not considered accurate or robust enough to be used as a professional architectural scanner. And by the way…I barely know what I just asked you so be kind with my lack of knowledge. Sorry for the late reply. Missed your comment. I understand what you mean. It’s good to know that none of the iPad apps are very good at capturing rooms, but that can be done with the Skanect software (I still have to review it… busy times). It will never be as accurate as industrial scanners and the color capturing of rooms is not very good at the moment… but the dimensions are surprisingly useful. Keep in mind though that the scanning range of the Structure Sensor isn’t big enough to scan very tall interiors that are out of reach. Hey Nick, interesting article. I’m curious about the comparison of dimensional accuracy between these options? Can you share this and did you test it? You mean between the Occipital Scanner App and itSeez3D, right? The dimensions come from the Structure Sensor’s data, so the dimensions are the same regardless of the software used. But it is good to realize that the results of the Occipital app are less detailed, which means that the raw point cloud is converted into a mesh with less polygons. Depending on what you want to measure, this can make a slight different in the measurements. If you really want to get the most accurate scans from the Structure Sensor, you should try Skanect. This software records all raw data and gives more control over the conversion to a polygonal mesh. Hi Nick, Thanks for this article ! I am wondering if on Naomi’s full body you create the two holes under pedestal (feet) with the Itseez business mode to extract powder ? That’s indeed correct: the itSeez3D Business software made the model hollow, added the pedestal (that’s optional by the way, but it will probably tip over otherwise) and added the escape holes. Pretty nice, right? I am wondering if an editing work of the 3D file (color and texture) is needed in order to have a good quality of the 3D figure. Did you do an editing work before printing it out with Shapeways ? Editing isn’t necessary in most cases. 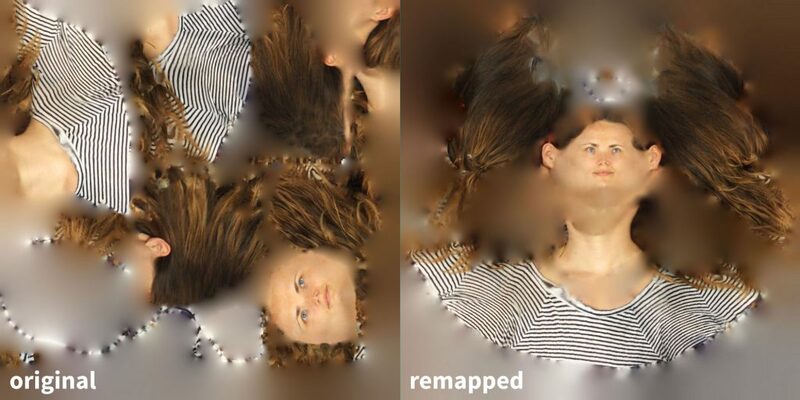 But like normal photographs you might want to do some retouching—especially with people. Most of my scans were sent directly to Shapeways without any editing. For a few I did some retouching in Maxon Bodypaint 3D (a version of Cinema 4D). Mainly textures but also a few geometry tweaks. Its Sculpting tools are surprisingly user friendly. Maybe I’ll do a post about that! Hi Nick, very good article (I purchased the Structure Sensor after reading your articles, mainly)! I had a question about softwares. I see here that you use Maxon BodyPaint 3D, is it possible to remove some parts of 3d scans and keeping the texture right ? Like removing the turntable from under someones feets, or removing a “Snudda” (directly bought 2) from under an object ? Wich is for you the best software for these tasks ? Just curious if you have already or are still planning on reviewing Skanect? You mentioned using sofboxes for scans – Are they really necessary? if so how did you place them for capturing models without turntable? It’s good to know that the light setup is only for capturing the color textures. The structure sensor can capture the geometry without it—even incomplete darkness! To answer your question: capturing color textures is simply photography, so the same principles apply. You can make photographs without any artificial light, but if you want better results indoors, you’ll have to use some kind of light setup. The reason I use softboxes is because I would like to avoid hard shadows on 3D scans, because models can be lit digitally to create dramatic effects if needed. For 360° scans without a turntable I place them evenly spread in a triangle around the subject and make sure one is angles slightly downwards and another upwards. thanks for the great reviews, really thorough. Have you had a chance to test the Next Generation Sense Scanner yet? We are exploring the idea of scanning people’s limbs to design prostheses. So, I’m wondering which one of the two, the Next Generation Sense or the Structure Sensor would work best for that? As matter of fact, I just received a Next Gen Sense last week ( http://instagram.com/p/BKpq8g-D4_E/ ). You can expect a separate review of that in November. And I will also do a comparison with the Structure Sensor (and Kinect V2). I also made a comparison post based on the specs ( http://nicklievendag.com/structure-sensor-vs-intel-realsense-3d-body-scanning-selfies/ ) and will update that with actual examples for better comparison. That said, it’s good to know that the hardware of the Sense 2 and Structure Sensor is similar in many ways, but the software is very different. The Sense 2 only works on Windows and works best with the Sense For RealSense software (reviewed here as part of another review: http://nicklievendag.com/xyz-3d-scanner-review#sense-for-realsense ). The Structure Sensor requires an iPad to wirelessly stream to both the Windows and Mac version of Skanect (which I will post a review of soon) which offers many more features than the Sense software. But you can also use connect a Structure Sensor directly to a computer with the “USB hacker cable” if you don’t need the color texture captures (which you probably don’t). I just came across the Structure Sensor today and then also your review of the product. can be rather small and up to thousands of square feet. open office spaces prior to buildouts. Happy to hear you thoughts on this. The mobile app will work fine for measuring small spaces. By combining the Structure Sensor with the Skanect (http://skanect.occipital.com) software (which is still planned for review soon) it’s capable of capturing rooms up to 12 x 12 meters. But i’ll advise this just for measurements—the Structure Sensor (or any depth sensor or 3D scanner) is currently not suitable to generate a visually pleasing 3D view of spaces of any size. Matterport (http://matterport.com) has solved this by combining 360° photography (for virtual tours) with 3D scans (for top-down overviews and measurements). You can only use that solution with their dedicated hardware. I’m a furniture designer and looking to get a scanner for taking basic hand made prototypes onto the computer for tweaking and then printing. Am I right in thinking the Occipital’s iPad apps are clearly the way to go as legs and the underneath of the objects are very important and the itSeez3D might struggle? We’ve also just got a new large iPad pro. How well this works depends on the scale of your prototypes. The Structure Sensor is best suited for objects with the size of full-scale furniture. And you’re probably bettet of by using the Structure Sensor on an iPad, combined with a computer running Skanect (http://skanect.occipital.com) software (which is still planned for review soon). But…. be aware that scanning flat furniture like tables is very hard (if not impossible) for depth sensors. And for both tables and chairs, their generic shape makes them hard to track for the software, but you can help this a bit by adding some tracker markers (see: http://nicklievendag.com/6-must-haves-for-3d-scanning-beginners/). Also, flat surfaces will never be completely flat. They always get a bit “blobby”. Thanks for your review. The improvement that itSeez3D app makes in the texture and resolution is really impressive. Do you know how they are doing it? Have you faced similar issue with itseez3d 4.1 version. Im already in touch with itseez3d developers. They are working on it. Im curious to know how the latest version is working with other people. Which escape whole(s) size you would recommend to set in ItSeez3d so the model (figurine) will pass checks and get printed by Shapeways? We were in the process of printing when received this email. A refund for the cost of the model has been initiated and will be posted in 3-5 business days. Description: This model does not have adequate escape holes to clean out the loose powder trapped inside. I’m not sure what the minimum is. I’ve worked with holes as small as 5 mm but it depends on the model’s shape I guess. Hi Nick. Very good job although sigomestando lost. I am new in this world and I have a Prusa i3 and a 3D shining. Now I want to make captures of outdoor sculptures and I think it would be best to take photos with a high resolution digital camera and a good program to generate the print model. I do not want textures only good model quality. What do you recommend me?. I am working at anthropometric survey for foot measurement so as to do I need two major things the first one is a structural sensor and to measure foot and the second one is I like to use a 3Dsizeme app I want to know this thing is good for research work. what do you recommend me???? I am new to 3D scanning but I really injoy the level of detail you are giving. Very informative write-up!